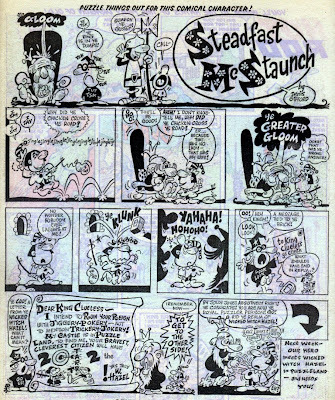 Four decades ago today, on Saturday 11th October 1969, IPC Magazines launched the first of many humour titles that would propel them to the top of the British comics industry. 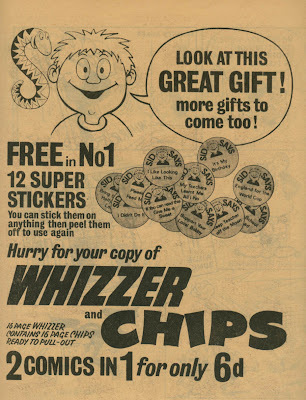 Whizzer and Chips No.1 arrived boasting the unique selling point of it being "Two comics for only 6d", - 16 page Chips comic was inside 16 page Whizzer. 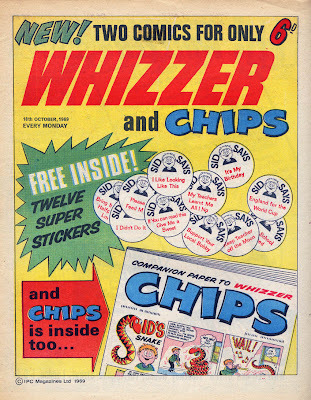 In reality, Whizzer and Chips was only ever one comic of course, and, within the walls of IPC, was regarded as such by its editor Bob Paynter. 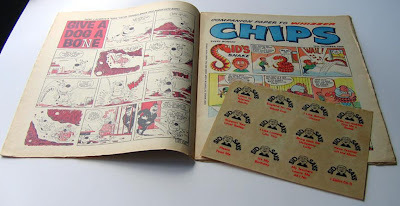 At the time D.C. Thomson's Dandy and Beano each had 16 pages for 4d and IPC knew they couldn't compete on that level, so the illusion of two comics for 6d worked, as Whizzer and Chips seemed better value for money as "two" comics than it would have as one. 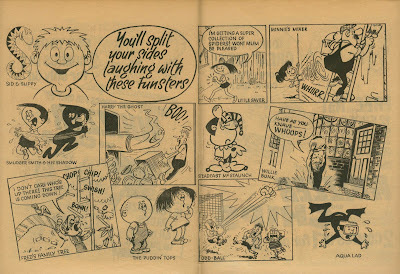 Adventure strips also appeared in the early issues of Whizzer and Chips, albeit fairly lighthearted ones compared to the sort of material that Valiant featured. Another gimmick that Whizzer and Chips was renowned for was the "rivalry" between the two comics, where characters from one comic would "raid" the other, - and the readers would have to spot them in backgrounds. 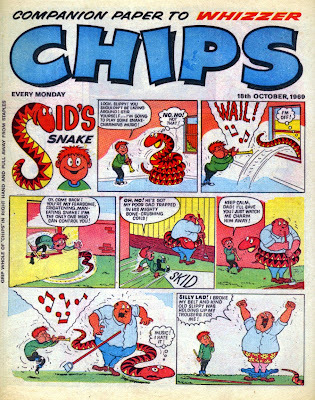 That didn't kick off until issue two, however Chips No.1 cover-starred Sid's Snake - the characters that from No.2 would be the cover stars and mascots of Whizzer. The famous cover star of Chips, accident-prone Shiner, didn't appear until the second issue. Right from the outset Whizzer and Chips looked slicker, stronger, and better designed than its Odhams predecessors Wham!, Smash!, and Pow! had been. 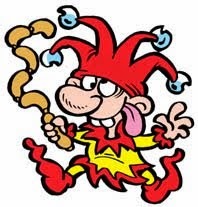 Personally, as a ten year old reading it back then, I found it entertaining but not as irreverent or, well, funny, as the Odhams weeklies had been. 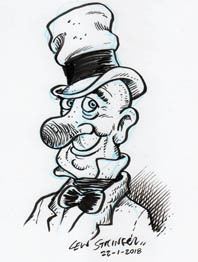 The hallmark of IPC's humour comics was "safe" comedy, and Bob Paynter would always encourage creators to be "careful", fearing backlash from parents and retailers. That said, a few hundreds thousands kids obviously enjoyed Whizzer and Chips immensely, given its long run. Even though I never found Harry's Haunted House anywhere near as entertaining as The Nervs, I still stuck with the comic until my early teens, - mainly due to the solid storytelling and artwork. The popularity of Whizzer and Chips led to the launch of Cor!! in 1970, and many other similar titles such as Whoopee!, Shiver & Shake, Monster Fun, Jackpot, and others which enjoyed varying degrees of success. 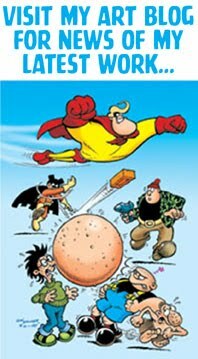 Even Fleetway's Buster was gradually revamped into an all-humour title to fit within the IPC humour group. 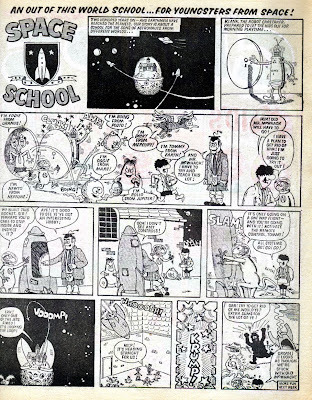 Forty years ago I remember a schoolmate of mine, Grant Hicks, running around the playground of our junior school with Whizzer and Chips No.1, ecstatic that he'd got "Two comics for the price of one". IPC's gimmick had paid off, and continued to do so for that title for many years. 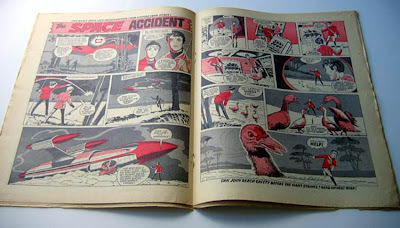 Companion comics which fell by the wayside, such as Knockout and Whoopee! were merged into the seemingly invincible Whizzer and Chips. Eventually the two-in-one comic's luck ran out. 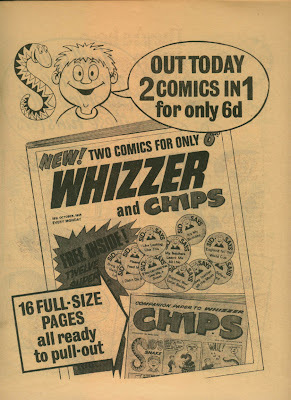 Whizzer and Chips folded in 1990, by which time a drop in sales and budget cuts meant that it contained a lot of reprint and had reduced its total page count from 32 pages to 24, phasing out the Chips insert. Yes, in the end Whizzer and Chips merged into itself, before being swallowed up by the long-running Buster. Cheers for that, Lew. That's made my Sunday that has. hm are you sure your dates correct? Cover says 18th October. 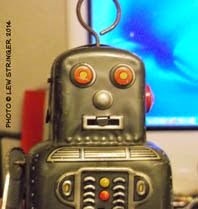 Good blog though even if its a week early. Yes. In those days comics were dated a week ahead. Issue 1 definitely came out on Oct.11th. W&C contained new content right up to the very end - Terry Bave contributed Odd Ball and Tarman of the Jungle, Jimmy Hansen contributed Sid and Shiner and the Bumpkin Billionaires, and I'm pretty sure from memory that Bobby's Ghoul was in W&C. 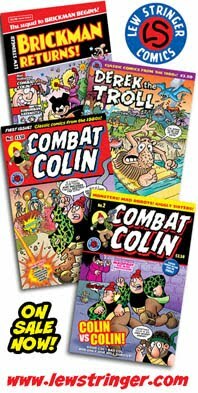 At the end, the reprint count wasn't actually that much worse than the 21st Century Beano - but I felt thoroughly ripped off when the 24 page W&C cost rather more than 75% of the 32 page Buster. Truthfully, the end came a few years earlier when DCT poached Bob Nixon and then Tom Paterson. 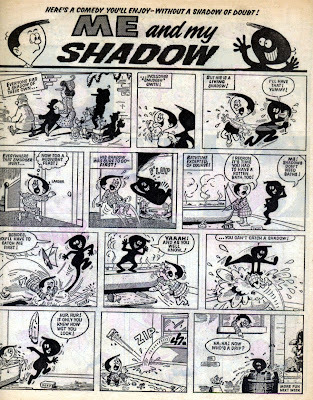 After that it was delaying the inevitable - Graham Exton's artwork on Sweeney Toddler was atrocious, in comparison with his layouts and scripts. I would make an argument that DCT was just way ahead of the game in obtaining Bob and Tom's services, and printing in full colour rather than solely primary and secondaries. 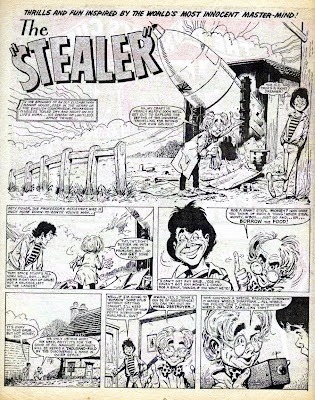 Simply, Euan Kerr and Morris Heggie had the initiative and the management backing to stay many steps ahead of Fleetway, whose comics became a substantially inferior product - every economy made went to the benefit of DCT as Terry Bave, Brian Walker, Trevor Metcalfe and ultimately Jimmy Hansen jumped ship. I bought that comic when I was 8. 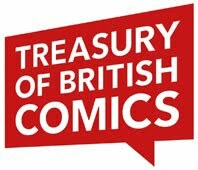 Lew, I love this blog even though it makes me sad that all those comics I collected as a nipper (and teenager), I no longer have. Keep up the excellent work. Thanks for the correction Andy. W&C was *mostly* reprint at the end though wasn't it? As I understand it, Fleetway were finding that the work of some of the people you mention simply wasn't as popular as it used to be so the editors didn't put up much of a fight when the artists moved over to Thomsons. One could perhaps put the blame on the scriptwriters for that of course, and perhaps with different strips they would still have been at the top of the polls. A few of them had already been Thomson artists in the Sixties as you know, so it was a case of them going back to their roots. Apart from Nixon and Walker I'm not sure if the time scale backs up the theory that they all "jumped ship". Surely Jimmy Hansen worked for Buster right up until it went all reprint? 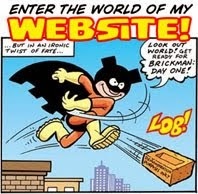 Even so, as a freelancer he also worked for other companies, such as Redan on their junior Batman comic, and later for Titan on the Wallace & Gromit monthly. Quite probably re reprint content - you have the distinct advantage that you can probably check one of the late copies, which I can't! :) In saying that, I could have been fooled by Bunter if I hadn't known Reg Parlett was in his mid-80s and the style hadn't been *so* old! Jimmy was the very last Fleetway artist to change over to DCT, just as you say, and I would certainly accept that he didn't make that jump until after Buster went 100% reprint, just as I would also accept that with the possible exception of Sid Burgon, most of those who changed probably did wait until the Fleetway work dried up. 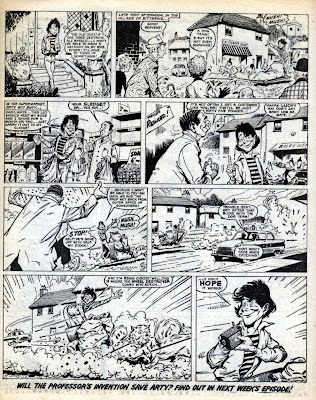 Others seem to have simply given up weekly comic work or retired altogether - like Colin Whittock, Martin Baxendale, Norman Mansbridge, Nigel Edwards, Roy Mitchell, Gordon Hill, Tony Hutchings, and finally Jack Oliver - of the above, I only occasionally see Mitch's Christian work and some years ago, Colin's contributions to a police magazine. I should really add to my earlier contribution that I liked Graham Exton's scripts for Sweeney Toddler, and I learned with interest some years ago that Tom Paterson would be asked to work from Graham's draft layouts in lieu of a typed script from time to time. It's just that Graham's execution in ink was atrocious - we know artists who can write well and writers who can draw well, but Graham was a writer who could design but not realise those designs satisfactorily. Strange thing is, the work was still at Egmont, albeit not in the old comic format, so I wonder if they tried adapting to suit? After Buster I moved on to be a scriptwriter on Sonic the Comic, Lego Adventures, and CiTV TellyTots magazine. Then things like Know-How and Toxic came up where I could draw as well as write again. 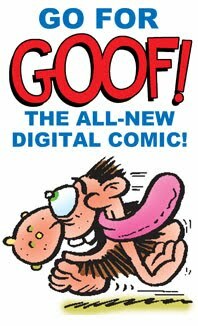 British comics have always evolved and one has to move with it really. Admittedly there wasn't a great deal of work out there for everyone, so perhaps some found doors closed to them, I don't know. Any chance of a scan of the Odd Ball or Minnies Mixer pages - I've got a feeling I had the first ish, and a peep at those would clinch it.. Isn't about time someone did a best of Whizzer and Chips reprints annual? Be a great Christmas for oldies like us.. This is probably shutting the barn door, but I only did about five Sweeny art/script combos before someone else took over from Tom. I didn't like the lack of detail in the new artwork, lost interest and gave up writing comics. It would have been nice to get more art to do so I could develop my own style, but it never happened. I tried hard to emulate Tom and Leo, but bits inevitably came out wonky, as it was my first (and only!) professional assignment. If mine was the "atrocious" work I apologise, but I suspect that it was the other guys' simplified work that caused offense. Hello is it correct that the first issue sold 1 million copies and this was the last British comic to do so? The Best of Battle is here!